Preheat the oven to 450 °F. Line a baking dish with aluminum foil. Mix the onion, garlic, paprika, thyme, salt and pepper in a small bowl. Mix until combined. To butterfly the chicken: Place the chicken on a flat surface with the breast facing down. Use kitchen scissors to cut along the length of the vertebrae. Cut from the one side of the bottom to the top end and then the other side. Remove the vertebrae, flip the chicken (breasts facing up) and press down until the chicken is flat. 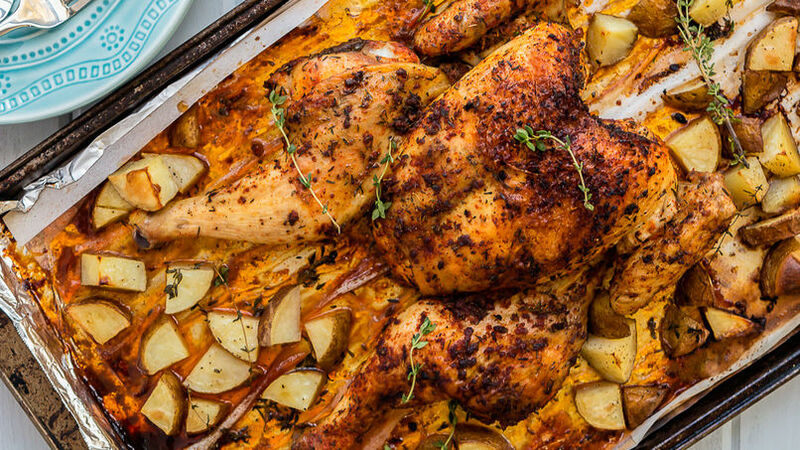 Place the chicken in the baking dish and cover with the mixture of spices on all sides, lift the skin a bit and season under it. Place the diced potatoes around it. Add the broth around the potatoes and chicken. Sprinkle with olive oil. Place a piece of loose aluminum foil over the baking dish to prevent the chicken from browning too quickly. Bake for 30 minutes. Remove the aluminum foil and bake for 15-20 minutes more or until the chicken is completely cooked and browned. Let sit for 5 minutes, garnish with thyme if you like and serve hot. Use a thermometer inserted in the thickest piece of the chicken to check the temperature. If the thermometer reads 165 °F, the chicken is ready. My life has been much easier ever since I learned how to butterfly a chicken. It used to take me almost an hour and half to cook a whole chicken in the oven, now I can have it ready in 45 minutes or less. Cooking time will vary depending on your oven, but I assure you that the cooking time is significantly less when butterflied. Besides, the chicken comes out of the oven perfectly browned and juicy, what more could you ask for? Try this technique and I’m sure you’ll love it!